There are the acupressure points for relieving Stomachaches, Indigestion, and Heartburn. Working on these points can help you get better quicker. You do not have to use all of these points. Using just one or two of them whenever you have a free hand can be effective. Caution: Do not hold this point deeply if you have a chronic or life-threatening illness such as heart disease, cancer, or high blood pressure. It is best not to hold this point for more than two minutes and to use it only on a fairly empty stomach. Location: On the midline of the body, one-half way between the base of the breastbone and the belly button. Benefits: Relieves stomach pains, abdominal spasms, indigestion, heartburn, constipation, and emotional stress such as worry and frustration that often causes digestive problems. Location: Two finger widths below the navel. Benefits: Relieves abdominal pain, lower back pain, constipation, gas, and digestive problems. Location: Four finger widths below the kneecap, one finger width to the outside of the shinbone. If you are on the correct spot, a muscle should flex as you move your foot up and down. Benefits: Relieves stomachaches, poor digestion, stomach disorders, and fatigue. 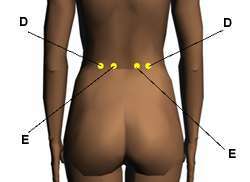 Location: Location: In the lower back two (Point E) and four (Point D) finger widths from the spine at waist level. Benefits: Relieves indigestion, abdominal pain, and stomachaches. 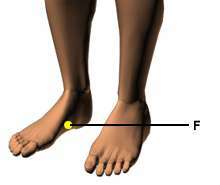 Location: On the arch, one thumb width from the ball of the foot toward the heel. Benefits: Relieves abdominal cramps, stomachaches, indigestion, and diarrhea. Also good for balancing a person who is inclined toward anxiety or hypochondria. Location: In the middle of the inner wrist, two-and-one-half finger widths below the wrist crease. Benefits: Relieves stomachaches, indigestion,nausea, and anxiety.